The Ultimate in Safety, Security and Stability The Drive Medical Gray Bathroom Safety Shower Tub Bench Chair guarantees your bathing experience can be a safe and pleasant one, minus the worry and unease that arises from fear of falling while in the tub or showering.Designed for maximum comfort, efficiency, safety, and ease of use, the Drive Safety Shower Chair is strong, durable and dependable. It’s everything you need in a shower safety bench seat.So, if you experience dizziness, or you’re unsure of your footing due to mobility issues when it comes time to bathe…You can now rid yourself of the stress and worry as bathing once again becomes relaxing and pleasurable, thanks to Drive Medical’s Blue Bathroom Safety Shower Tub Bench Chair with Back. Go ahead…Experience the Drive Difference Now! 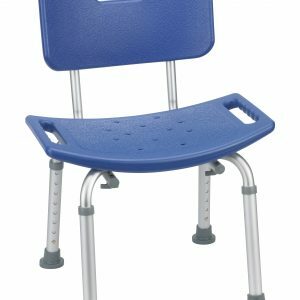 Be the first to review “Bathroom Safety Shower Tub Bench Chair, Gray” Click here to cancel reply.